When, in the first century AD, Pliny wrote about papyrus in his Natural History, it already had been the most common writing material in the ancient world for three millennia (indeed, the word “paper” itself derives from the Latin, papyrus). 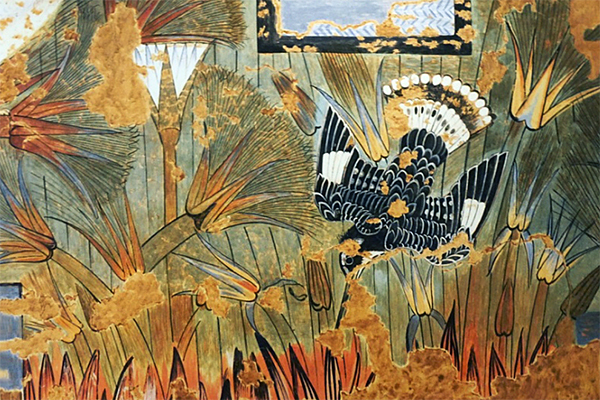 In Book XIII, he describes how papyrus is made, “since our civilization or at all events our records depend very largely on the employment of paper” and it is the thing upon which “the immortality of human beings depends.” Native to the Delta marshes of Egypt, the tall papyrus reeds were cut and peeled, and the fibrous pith split into thin strips, which were laid on a flat, wet surface, first vertically and then horizontally. Pressed or pounded together, the crushed fiber of the two layers bonded to form a sheet of papyrus, which was dried in the sun and polished smooth with ivory or shell. These sheets then were pasted together along the grain, each one overlapping the one on the right so that the nib of the pen would not catch where they were joined. The result was a long roll or charta, a term that came to signify any form of paper, whether written or unwritten. The manufactured papyrus roll, relates Pliny, comprised no more than twenty sheets (about fifteen feet). The book roll or volumen (from volvere, to roll), on the other hand, could be as long or short as needed, but tended to average thirty to thirty-five feet (sufficient to contain a single book of Thucydides). The standard way of reading was to unroll (explicare, “to unfold”) the scroll with the right hand, while winding the portion that had been read back up with the left. To give the roll stiffness and to prevent bending, it was wound around a wooden or ivory rod, or around rollers, forming a cylinder that could be handled by the projecting knobs on the ends. Often, too, another sheet of papyrus (protocol) was attached at the front to protect the roll when wound. The outside usually was left blank, although Pliny did bequeath to his nephew, Pliny the Younger, one hundred and sixty rolls on which both sides had been written (opisthograph). Finally, a tag or titulus, written on a separate piece of paper and affixed to the roll, identified its contents. The best quality papyrus came from the center of the stalk, which Pliny categorized as Regia or Augusta, and increasingly inferior grades from the outer layers. The size of the sheet was determined by the length to which the horizontal strips could be cut and still remain strong. Wide sheets were considered best, a sheet of XIII digiti. As well as width, which in the Roman period normally was four to nine inches, papyrus was esteemed for its fineness, thickness, whiteness, and smoothness. Pliny goes on to say that Claudius had the outer layer made with stronger fiber, keeping the best grade only for the writing surface and, on that account, it had come to be preferred. The earliest description of the scroll is by Catullus (XXII), who chides another poet for not having used an erased sheet to compose his rustic verse but writing instead on polished carta regia in new book rolls with ivory handles wrapped in red parchment and tied with red thongs. Ovid also describes the roll, lamenting his exile from Rome. The roll was stored upright in a book-box (capsa), horizontally on a shelf, or in a pigeonhole. If particularly valuable, it could be placed in a chest or wrapped in a protective sleeve of parchment and tied with thongs. An author’s work very often would require several rolls, which would be kept in the same book-box. It was these physical limitations—the length of the papyrus roll and the number of rolls that could be stored together—that tended to define the divisions of literature. Typically, the papyrus roll allowed for columns (paginae) eight-to-ten inches high, containing between twenty-five and forty-five lines, with margins of about half an inch between them and wider margins at the top and bottom. Column width varied but tended to be narrow (between two and four inches), so that, to be read, no more of the scroll would have to be unrolled than necessary. Words seem to have been separated, usually by points (interpuncts); and some marks of punctuation were used, although they tended to be arbitrary. (In the second century AD, in a revival of archaism and renewed interest in writers of the early Republic, the Romans adopted the Greek model and wrote without word division.) Text was written in capitals (majuscule). Pen and ink were used: the pen (calamus) made from a trimmed, split reed, or sometimes from a thin sheet of bronze or copper rolled to approximate the same shape; the ink, which was kept in an inkwell (atramentarium), from a mixture of carbon soot, resin, wine dregs, and cuttlefish ink. At the beginning of the second century AD, a brownish ink also was derived from iron and tanning compounds that was more suitable for parchment. It was possible to rub the writing surface at least partially clean and use the sheet again. These palimpsests often are the only form in which some classical works have been preserved, still discernible beneath the later sermons or saints’ lives written over them. Papyrus was expensive, and for casual correspondence, such as drafts or notes, student lessons, and even legal and official documents, the wooden writing tablet or tabula cevata was used instead. The leaves of the tablet, which were fastened together with a thong or clasp, had a recessed surface filled with colored wax that could be inscribed with a bronze or iron stilus, one end of which was flat so the wax could be smoothed and used again. Tablets with two leaves (diptych) were common, but became impractical if too many were added. A wall painting from Pompeii shows a young woman holding a tablet with four leaves, although no examples have been discovered with more than ten. Wooden leaf tablets of birch or alder saplings also were used for writing. So thin that they could be stitched together and even folded, a cache of these wooden slips, written with ink, has been found at the Roman outpost of Vindolanda in Britain, near where Hadrian’s Wall later would be built. Although the papyrus roll continued to be used, it was not ideal. The material, itself, was durable (Pliny marveled at having seen documents written on papyrus two-hundred years earlier) but constantly being unrolled and rolled back up again caused abrasion and, even though writing only on one side of the page reduced the problem of wear, it was inefficient and made the roll that much more cumbersome to store. Author and title were indicated at the end of the text (colophon) and so were less vulnerable to damage when the roll was rewound, but this made it more inconvenient to identify the contents (there was a tendency, too, for the titulus to fall off). Since the individual sheets of the roll were seamlessly joined, lines and columns were not uniform but varied in length and size. Nor were they marked, which made citation difficult and often inaccurate. Throughout antiquity, vellum, or parchment as it was later known, had been used as an alternative to papyrus (parchment usually refers to the treated skins of cattle, sheep, and goats; and vellum to that of younger animals). The skins were soaked in lime and scraped, stretched and dried, rubbed smooth with pumice, and cut into sheets which then could be sewn together. Although Pliny is mistaken in saying that parchment was invented at Pergamon because of an embargo on the export of papyrus from Alexandria, it is true that a shortage may have forced the library there to convert to the use of parchment, at least temporarily, or to have refined its manufacture. Eventually, in an important innovation, the Romans substituted parchment for the wooden leaves of the tabula to form the notebook (membranae), which was the prototype of the modern book. Parchment was folded in half to yield a gathering (or quire) of two leaves or four pages, one-half the width of the original (folio). Folding the sheet again gave four leaves or eight pages (quarto); and yet again, eight leaves or sixteen pages (octavo), which was the size of most notebooks. Papyrus also could be used to make books, but the sheets were not large enough to be folded more than once, which meant that a papyrus book had to be formed from a number of single-sheet quires. Stitched together and protected by a cover, the parchment notebook was used for accounts, notes, drafts, and letters. The earliest evidence for its literary use is the poet Martial, who, writing toward the end of the first century AD, commends the new form to an unaccustomed public: “Assign your book-boxes to the great, this copy of me one hand can grasp” (I.2). Because of its resemblance to a block of wood, the tablet came to be called a codex. There is a similar association in the Latin word for book (liber), which originally meant “bark.” So, too, the Greek name for the papyrus plant, biblos, came to mean the roll made from it, then “book,” and ultimately, the Bible. And yet, the practical advantages of the codex in terms of size and convenience and the better, more durable protection offered by its covers were not, by themselves, sufficient reasons to replace the papyrus roll. That impetus came from the early Christian church, which adopted the form of the codex to differentiate its writings from the sacred books of Jewish scripture (which could be copied only in the format of the roll) and from pagan literature, which also was equated with the roll. More importantly, the codex permitted longer texts, such as the Gospels, to be contained within a single volume and to be referred to more easily. Although papyrus continued to be used by official scribes and copying houses and for literary production, as was the wooden tablet for more ephemeral material, by the second century AD, a shift from papyrus roll to parchment codex was evident. By the fourth century AD, Christianity had triumphed, and the codex replaced the roll, just as, in time, parchment replaced papyrus. It was a development in the history of the book as monumental as the invention of printing a thousand years later. References: “Book Production” by Susan A. Stephens, in Civilization of the Ancient Mediterranean (1988) edited by Michael Grant and Rachel Kitzinger; The Birth of the Codex (1983) by Colin Roberts and T. C. Skeat; Cambridge History of Classical Literature (1982) edited by E. J. Kenney and W. V. Clausen; Books and Readers in Ancient Greece and Rome (1951) by Frederic G. Kenyon; Ancient Libraries (1940) by James Westfall Thompson; The Oxford Classical Dictionary (1970) edited by N. G. L. Hammond and H. H. Scullard; Pliny, Natural History (1960) translated by H. Rackham (Loeb Classical Library); Latin Palaeography: Antiquity and the Middle Ages (1990) by Bernhard Bischoff; Scribes and Scholars: A Guide to the Transmission of Greek and Latin Literature (1991) by L. D. Reynolds and N. G. Wilson; Cassiodorus: Variae (1992) translated by S. J. B. Barnish; “Ancient and Medieval Accounts of the ‘Invention’ of Parchment” (1970) by Richard R. Johnson, California Studies in Classical Antiquity, 3, 115-122.